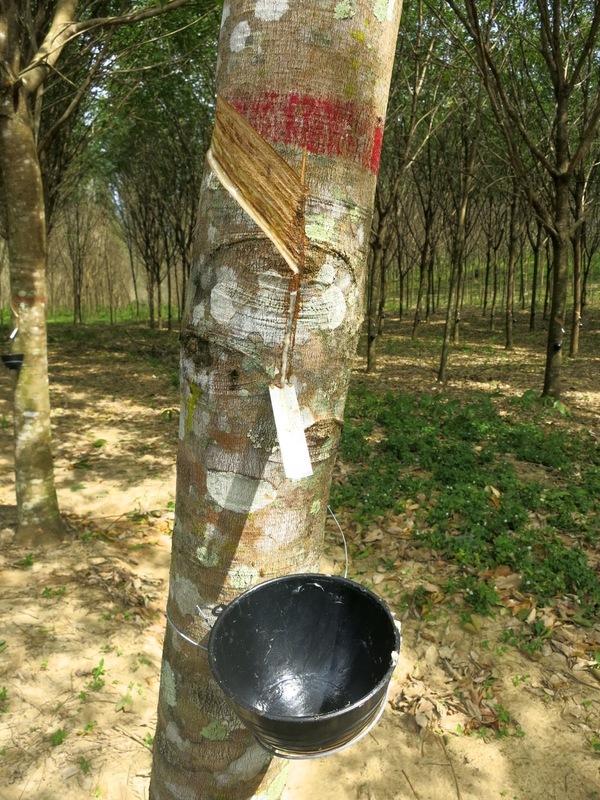 The last couple of weeks we passed through a countryside that is characterized by a mono-culture of rubber trees. It's the main agricultural activity in the utmost south of Thailand. Miles and miles of rubber trees, with the typical slanting cuttings in the bark. Through the bark runs the latex, a white syrup-like liquid that is freed through these cuttings and slowly flows into a cup via a little hanging gutter. It's important to realize that it's not the tree's sap that is taken from the tree. This sap runs through the cambium, just under the bark, so the tree is not harmed in it's growth. The trees are up to 10 meters high, have a stained bark and are not thicker than 20 centimeters in diameter. The plantations have the trees in regular rows in a monotonous line-up. It looks like it's the business of small local farmers and that there are no big industrial and foreign owned plantations. Sometimes you see a farmer, or often a child, walking through the plantation and emptying the cups in a bucket or other plastic container. They then take this to a collecting point, of which there are many. Dirty places! It's then a liquid, and from there it's transported further in a tank on a pick-up truck. But more often we saw the latex in a dried, solid form in the cups and being collected in big dirty lumps on pick-ups. Why there is this difference we don't know. We do know that formic acid is used as a collagen, but if that is the case here? Maybe it is in the cases when we saw that some farmers proces the crude latex themselves. The result we saw hanging on racks to dry, as if the towels of a hotel have been washed. Sometimes these 'towels' are white, sometimes brownish, or a dirty white. Once or twice we passed a big rubber factory. We think that here the locals work ends and the big industry does the rest. We made some pictures of this form of agriculture and loaded them up in this little album.